Go to the MySpace home page and click the Sign Up link. This link takes you to the main Sign Up for MySpace page. Click the Musician, Sign Up Here link below Profile Types. 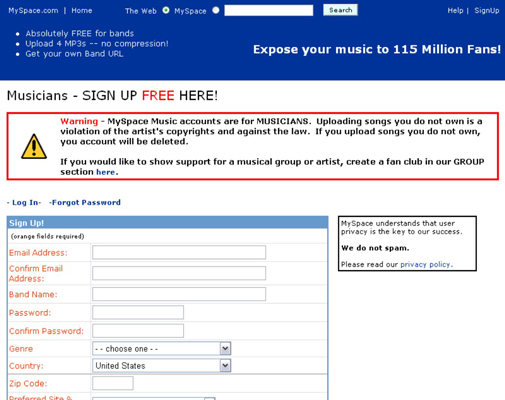 The MySpace Music Sign Up page opens. Fill out all required information and click the Sign Up button. Make sure to select the check box that lets MySpace know that you agree with their Terms of Service and Privacy Statement. The Registration Completion window opens. In this window, specify your band’s MySpace URL, genre(s), Web site, current record label, and label type. You can also add a profile picture, invite friends, and upload songs. Your MySpace music profile is now created.